Christmas is almost here and that spells trouble for Santa. Hiding out in the White Knights' castle in fear of what Anti-Santa may try next, he has been plotting how to turn Christmas back into a time of joy instead of sorrow - but he needs your help. 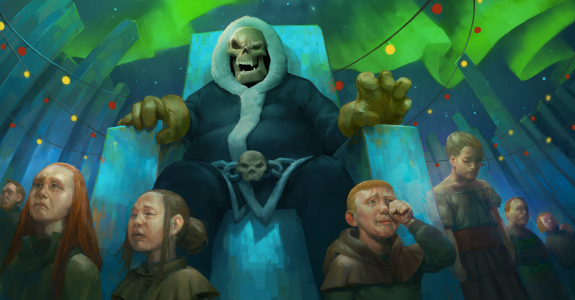 Make your way to the White Knights' castle in Falador to track down Santa and start your Christmas adventure! Two new Santa hats - The black Santa hat and inverted Santa hat! A mysterious man has appeared in Port Sarim with a damaged ship. Using an item on any longbow inside a bank now correctly produces the nothing interesting happens message. Corrected a problem where the timer in Pyramid Plunder would interrupt actions such as casting a home teleport spell. It is no longer possible to spellbook swap using the magic Skillcape while spellbook swapped. The Knights in the Camelot training room are now immune to venom. Level up messages relating to the canoes no longer reference them being members content as they are available in F2P. Sir Kay’s challenge scroll which asks about a quantity of fountains has had a grammatical error fixed. Two cases where 'crystal' was spelt 'cystal' have been fixed. You can no longer enter the Champions' challenge fight area when skulled on Deadman mode. The Catherby crate can no longer be hidden in when skulled on Deadman mode. Anchovy Pizzas now have the correct placement in the HP skill guide. Sea turtles now state the correct healing amount in the HP skill guide. The Explorers' ring will no longer provide its free alchemy spells on F2P worlds. A typo in Carado’s dialogue, ‘ballon’ has been corrected to ‘balloon’. A typo in Sir Renitee’s dialogue, ‘contant’ has been corrected to ‘contact’. Was the blue skin thing ever considered? I only ever saw people talking about it on the forums didn't see anything about it in any dev blogs. STOP releasing rare items like partyhats, santas etc.. You just killed the prices of them all over again. Also can you guys please release reindeer so we can ride them throughout Runescape and make travelling more fun? Thanks. Anchovy Pizzas are now have the correct placement in the HP skill guide. >A mysterious man has appeared in Port Sarim with a damaged ship.